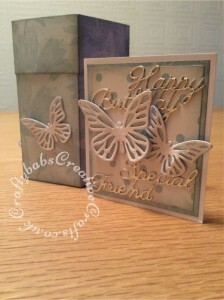 Here are two examples of cards I made utilising The ‘John Next Door’ Opera box die as a different take on an envelope. 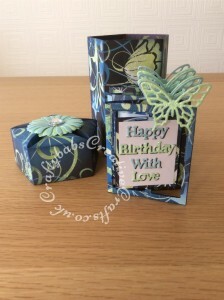 Obviously these aren’t suitable for posting but they make a really nice and different surprise when making cards for Special people. 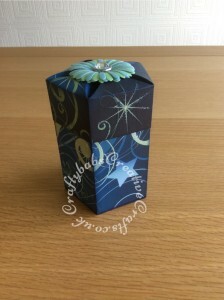 The one drawback, I quickly realised, is that you are limited to making quite a small card but I think they are quite cute. The inside of the box lid, once assembled, protrudes down inside the box and I used this as a guide when deciding what size to make the cards. The first example is a simple small card. 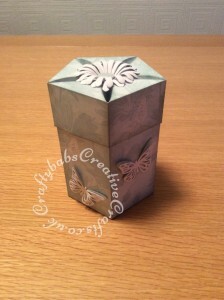 For the second example I made an accordion card and arranged the butterfly die cuts to fit around the protruding parts of the lid so it looks a little bigger. 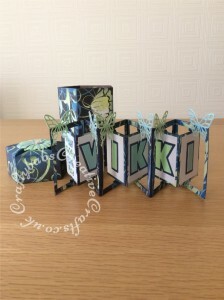 These are great projects for using up any double sided card stock you have as both sides will be seen. 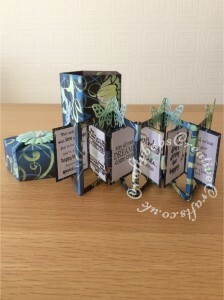 To see full sized pictures and details of dies etc used, just click on the images.